‘So, what are you going to do after you graduate?’ A cruel question often posed by relatives, and sometimes even friends. It is particularly terrifying question for the soon-to-be finalist. Although a question potentially deflected by further study— ‘maybe a Masters or a PhD?’ is always going to be a better sounding answer than admitting that you don’t have a clue. The Arabidopsis has just germinated, and is growing in one of the growth rooms beneath the Department. During this first week I have learnt many useful things; the location of the Growth Room (in the basement); how to sow hundreds of Arabidopsis seed (sterilise them in bleach then pipette evenly onto plates of agar); where the liquid nitrogen is kept (under lock and key behind the building) and more importantly, what I will be working towards over the next six weeks. 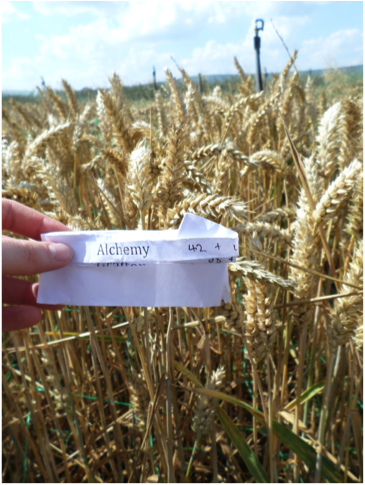 Harvesting and correctly labelling each variety – if you discover something amazing in a particular wheat sample it’s so good to anyone if you can’t remember which variety it belongs to! All of the experiments that I’m carrying out will be investigating the role of cytokinin binding protein (CKP) in dormancy. Cytokinins are a group of plant hormones involved in cell division/growth and CKP prevents their action – halting germination or growth for a given period of time. The CKP levels in different crops play a role in the security and reliability of our food supply. Low levels of CKP reduce the length of time which potatoes can be stored without sprouting. Whilst in wheat, low levels correlate with greater pre-harvest sprouting (when the grains of wheat germinate whilst still attached to the parent plant, reducing crop yield and making useless bread). 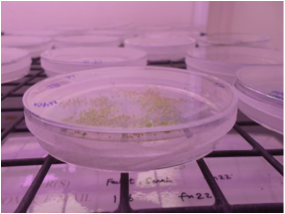 My experiments will help provide evidence required to begin conventional breeding programmes in both wheat and potatoes, in order to produce crops with a higher level of CKP. Grand unifying purpose aside, I did very little towards those ends, mainly collecting and preparing plant material – planting the Arabidopsis, ready for harvest in four weeks or so and picking ears of wheat. It was rather a lazy week, but you have to start somewhere! Your title is simply AWESOME! I liked the way you shared your experiences. In addition, it has been drawn my attention as I’m focusing on cytokinin to understand cell division mechanism. Please feel free to communicate with me.